I’m sad. One of my most treasured Christmas ornaments has been broken. G made it when he was 4 years old at day care. When putting up our garland, it fell down and knocked down our small tree. The ornament fell and a couple of pieces broke off. I’m going to save it even though it’s broken. Maybe I’ll save it in a little box to keep it safe and from potentially cutting children. I just don’t have the heart to throw it away. Would you? Isn’t it adorable? There is no way I can get back that 4 year old sized hand. It can’t be redone. I hope you all can tell that the snowmen are fingers in the photo. They painted his hand white and then had him hold the ornament. 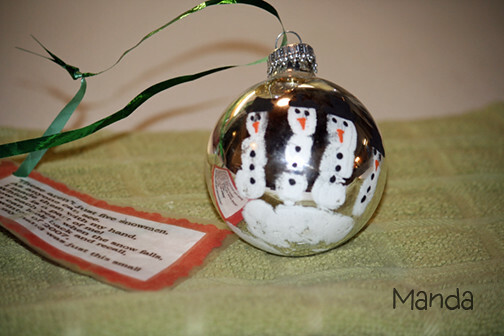 Then, they painted in the snowmen details. Oh, it’s just so cute — my heart is breaking. 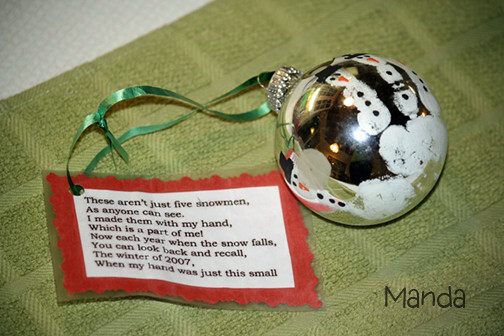 I must do something like this for Baby E. It won’t replace G’s ornament, but it will help me remember Baby E’s little hand. Although, I am afraid that he’d try to squeeze the glass ornament. Maybe it should wait until 3 or 4 years old? Gotta think of something else. Any ideas?